We've all used those little tubes of epoxy resin to make minor repairs around the house or workshop, but does epoxy have a place in the furniture maker's armoury of adhesives? After all, we already have a pretty wide choice ranging from traditional animal glues through urea formaldehyde and polyurethanes to PVA and aliphatics, so why would we need another? 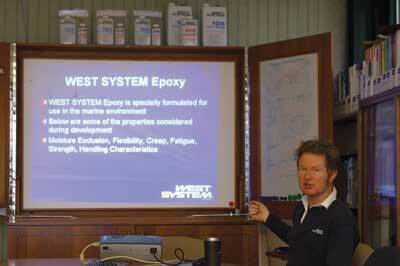 Living on the South Coast has inevitably brought me into contact with boat lovers all of whom seem to swear by epoxy resin, so I welcomed the opportunity to find out what it has to offer by attending a one day course at Wessex Resins' - WRA - headquarters in Romsey. Wessex manufactures the WEST SYSTEM products and markets them throughout the UK, Europe and Asia under licence from WEST SYSTEM in the US. But this is not just a manufacturing operation, Wessex also has its own research and development capability, using it to develop its own improvements and other specialist products under the WRA brand. Most importantly, WRA claims to offer the same first class levels of technical support to all users of its products whether they are a big user or a man in his shed. That a relatively small company like WRA can achieve apparent ubiquity in yacht handlers across the UK, with a reputation to match, lends credence to this service claim. The day started with tea and coffee followed by a talk about the WEST SYSTEM product range, its uses, origins in US ice boat racing and development over the years. My 10 fellow students - were, to a man, boat people of one description or another - so not a very promising start for a furniture maker, you might think. However, our main tutor, Technical Operations Manager, David Johnson did a great job of keeping the content as relevant to everyone as possible and always maintained an entertaining and approachable style. After the initial talk we moved to the lab to make a small ply toolbox, using coved fillets of thickened epoxy along joints. Not pretty or remotely fine woodworking but the strength of the bond achieved was demonstrated very effectively when our tutor jumped on two pieces of ply joined in this way - it was the ply that broke. A very acceptable light lunch was followed by talks and demonstrations of glass fabric reinforcement, glass reinforced plastics repair and hardware bonding techniques, rounded off with a Q&A session. 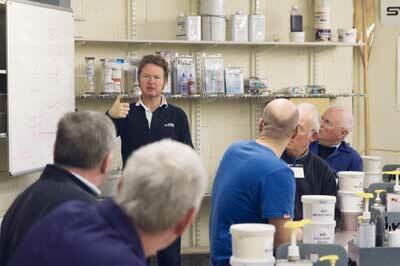 So how relevant is this course and epoxy to furniture makers? Judging by the outline above you might think the answer is 'hardly at all'. If your making is confined to very traditionally constructed furniture in solid wood, that is probably right, because your gluing needs are likely to be very satisfactorily met by mainstream wood glues that can be used straight out of the bottle. If, on the other hand, you are interested in veneering, laminating, mixing wood and metals or lightweight construction techniques, then it all becomes much more relevant. Whilst most of this course is about the application of epoxy-based products to boats, it necessarily goes into material properties and harnessing those properties to particular materials and techniques in some detail. A significant proportion of that detail can be highly relevant to what the more adventurous sort of furniture maker may be trying to achieve. 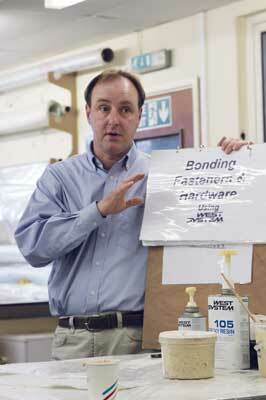 Unlike most woodworking adhesives, epoxy is a two-part product - resin and hardener. It cures by means of an exothermic - heat producing - chemical reaction between the two components. Another difference is that pot life and thin film open times can differ widely. 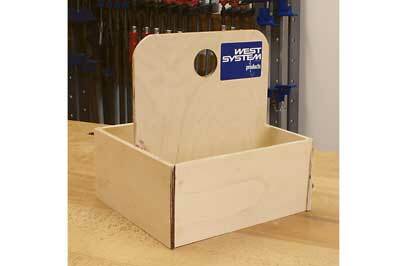 Both depend on a number of factors and are much more flexible than most mainstream woodworking glues. This flexibility comes from both product selection and handling. The WEST SYSTEM offers a range of hardeners giving different working times with a starting point of around 60-70 minutes - as a thin film - at a room temperature of 20°C. Open times roughly halve with each 10° increase in temperature. Pot life is dependent on the speed of the heat producing reaction between resin and hardener and this, in turn, is highly dependent upon the mass of mixture in the pot. 100g of resin/hardener in a low surface area pot like a paper cup will heat up rapidly giving a pot life of only 10-15 minutes and can ultimately attain 200°C, with the obvious hazards of injury and possible ignition of sawdust or shavings. The very complete mixing required for optimum results is most easily achieved in this type of container so it is best to transfer the glue to a shallow tray or dish after mixing where the large resin surface area will greatly slow the reaction and correspondingly extend pot life. For good results the ratio of resin to hardener must be accurate and it is worth investing in the WEST SYSTEM resin and hardener pumps which ensure this. For small quantities where less than a pump stroke of each is needed, mixing by weight using digital scales is a good alternative. I must admit that my preconceived ideas about epoxy involved highly toxic chemicals, noxious fumes and heavy duty extraction, but I was agreeably surprised. It is polyesters that are associated with most people's ideas about resin/fibreglass bonding and, while epoxy is not totally benign, it uses low levels of volatile organic compounds - VOCs - and is pretty nearly odourless. In reality, the precautions needed for woodworking are no greater than for most other glues - protective gloves and a well ventilated working environment and eye protection where appropriate. 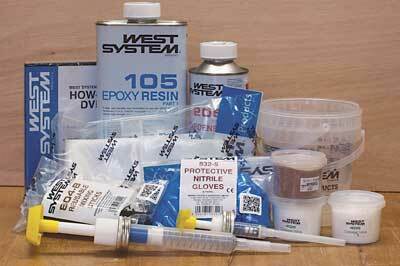 Apart from being two-part, epoxy differs from most other woodworking glues in a number of ways. Firstly, the bond it forms can be significantly stronger than most other glues. This is mostly unimportant because many glues can form a bond which is stronger than the wood itself. Even so, this can be valuable in particularly high load situations but there are other properties particular to epoxy that have distinct advantages in two aspects of furniture making - veneering and hardware fixing. 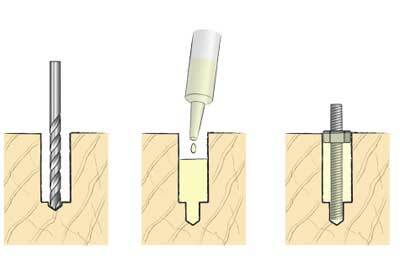 For veneering, stability of the glue joint is of paramount importance. 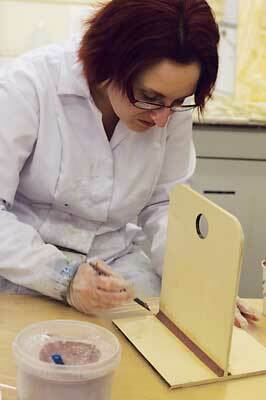 You don't want the veneer to creep and you don't want it to shrink relative to the substrate to which it is glued. Either or both of these can happen with mainstream water-based glues. 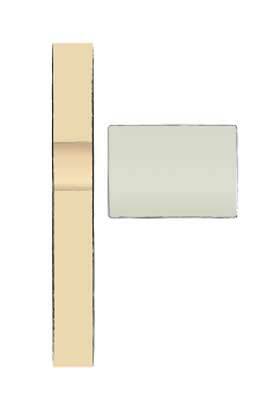 Modern knife cut veneers are generally only about 6mm thick, so their absorption of moisture from a water-based glue can result in a wide disparity in moisture content between veneer and substrate. PVA and aliphatic glues allow creep so shrinkage as the veneer dries can result in highly embarrassing gaps appearing some time after the job is finished. Urea formaldehyde glues don't allow creep, but they do add water to the veneer which again, will want to shrink as it dries. 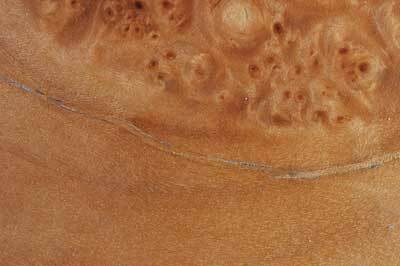 If the bond is perfect across its whole area, the glue may well have enough strength to resist shrinkage but, if there is an area of weakness or your piece of veneer has particularly high inherent stresses, then splits can appear. Epoxy adds no water and doesn't allow creep so, having suffered splitting and the consequent need for a time consuming narrow, curved 75mm long repair I can see the advantage of it for veneers. I haven't yet carried out any trials with veneer and epoxy but, given these theoretical advantages and its long open time, I can see it becoming my glue of choice for this work. 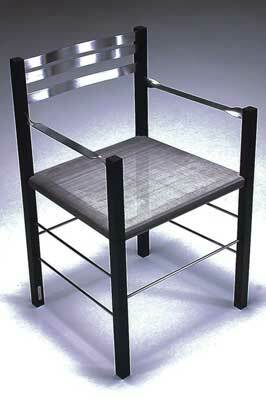 Contemporary furniture makers often use a mixture of wood and metal in their designs, particularly where visual lightness is required. A load bearing stainless steel tie can be very thin and delicate compared with something of equivalent strength in wood and impart a very different visual feel to a piece. This is very well illustrated by Toby Winteringham's 'Square2' chair, which is based on the very first chair he designed as a student. The original with conventional construction in solid wood has 30 joints; this version has no conventional joints, instead relying on epoxy to bond the stainless steel components into the bog oak (Quercus spa.) legs. The flat components have a piece of threaded stainless studding welded to each end, which is epoxied into the legs. The key provided by the threading, combined with the ability of epoxy to penetrate end grain provides a very strong joint. 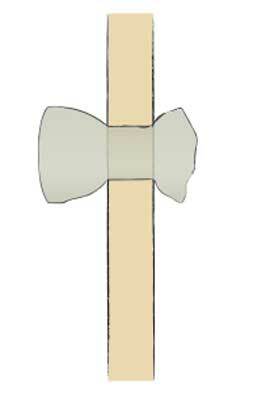 A similar mechanically strong joint can be achieved on the plain round stretchers by forming a groove in the sections which are within the legs. Unlike most other glues, epoxy shrinks by only a small fraction of 1% during the curing process. This confers gap filling qualities and makes it ideal for bonding in hardware. For a strong permanent fixing a good thread can be cast into epoxy (see Fig.1). The pilot hole is deeper than the resin insert so that the screw will stay upright while the resin cast cures. 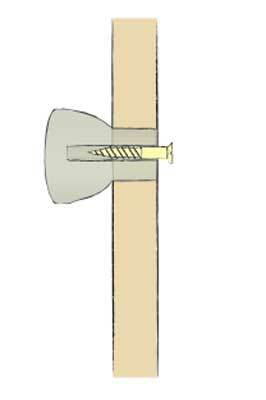 Waxing the screw before casting will allow easy removal. 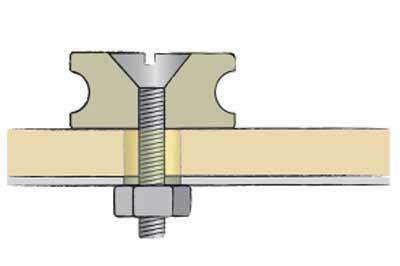 If the fitting is likely to be removed frequently, a more wear resistant fixing can be obtained by casting in a nut at surface level (see Fig.2). 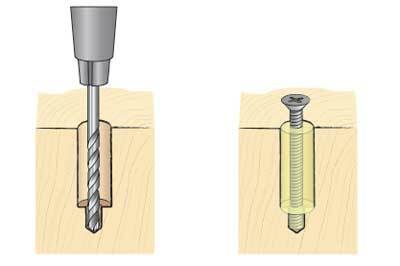 For worn out screw holes, drill out the holes, inject resin and replace the screws. 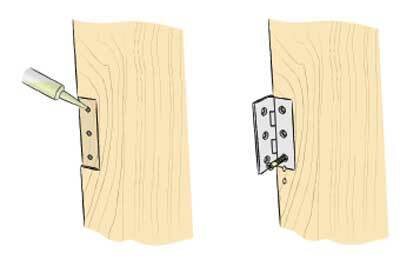 If the screws may need to be removed, wax them before reinsertion. The weight of traditional solid wood furniture is rarely a major problem because most furniture is moved only infrequently. However, there are sometimes very good reasons for wanting to minimise weight, such as a setting where the flexibility to allow different uses of a space makes frequent moving essential or where the piece will be transported from place to place. This sort of remit is very demanding because pieces that will be moved around are generally subjected to much greater stresses than those that stay put. Adding strength while removing weight is an engineering challenge. 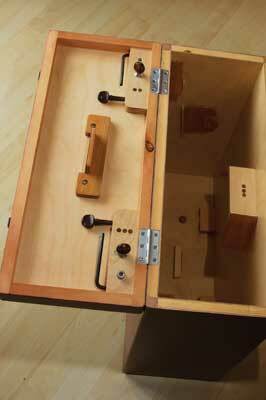 The most effective solution for cabinet work is to substitute torsion boxes for solid wood or sheet material panels. 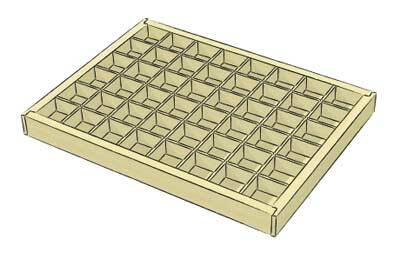 Torsion boxes comprise a lightweight lattice of - usually - softwood sandwiched between two thin sheets of ply or MDF. A lattice is inherently strong but this is greatly enhanced by the glued on outer skins for which birch ply is the ideal material. This externally rather scruffy case designed to take the desk and base assemblies for two music stands has 4mm outer and 1.5mm inner skins. After years of being loaded in and out of vehicles it is a bit battered but structurally as good as new. The usual method for constructing a lattice is to half lap the ribs; an exacting and very time consuming process if the tight joints needed for maximum strength are to be achieved. The thickened epoxy fillet jointing method used on the Wessex toolbox offers an equally strong alternative without the need for all those half lap joints and the weight penalty will be small if a low density filler is used to thicken the epoxy. A more modern and lighter alternative to the traditional lattice is aluminium honeycomb, which is readily available online. Attractive though the torsion box is as a lightweight solution, finding sufficient local strength to make fixings into it can be problematic. In my music stand carrying cases, I overcame this by incorporating solid wood sections into the lattices to take screwed on fittings such as handles, hinges and catches. This carries both a time and weight penalty for which Wessex have some ingenious solutions. I got a lot out of the course and will certainly be using epoxy for veneering, some laminating jobs and other applications where its special properties offer advantages over other cheaper and more convenient glues. This enjoyable course represents good value for money at Â£145, particularly bearing in mind that it includes lunch, you come away with over Â£50 worth of WEST SYSTEM products and significant discounts are offered on products bought on the day. Even if you don't fancy the course, I can highly recommend investigating the WRA website, which contains a wealth of information about their products and comprehensive user guides.